What do you mean by cassis? It’s a question I have heard quite often—usually at wine tastings, when someone with a nose in a glass of Cabernet claims it as one of the wine’s aromas. Several others in the group may nod in approval at the spotting of a black currant jam- or Cassis liqueur-like aroma in the glass. Others have never heard of it—and thus, the question at hand. Cassis is actually many things—a seaside resort town in Provence, a French AOC wine-producing region dominated by white wine, and a black currant-flavored liqueur produced in many parts of the world, but particularly famous in Dijon. Read on for a bit more information on the many faces of Cassis! 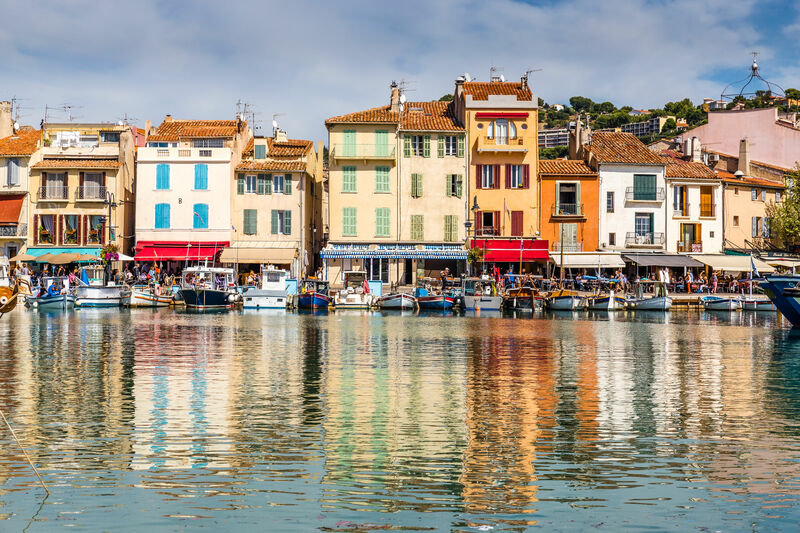 Cassis—the Town: If you happen to find yourself on the Mediterranean Coast, perhaps in the Provencal town of Marseille, and if you drive south on coastal route highway 559 for about 15 miles, you’ll end up in the seaside resort of Cassis. The waterfront of Cassis is a picturesque fishing port lined with cafes and restaurants, making it both a wonderful place to stroll as well as one of the most popular tourist destinations in Provence. While there, you can take the petit train touristique around the town, walk along the waterfront, or grab a boat tour to the impressive calanques (narrow, very steep rocky inlets found along the Mediterranean coast). The town is snuggled at the foot of Cap Canaille–a 1,293-foot (394 m) high seaside cliff (the highest in France). The very picturesque Route de Crêtes (Corniche des Crêtes) runs over the top of the cliff, linking Cassis with the nearby towns while offering stunning views of the cliffs, the sea, and the towns in between. If you’d like to find the sunniest part of the town, follow the signs to La Cheminee du Roi Rene (King Rene’s Fireplace)—a sun-drenched area at the junction of the two water-side walkways known a s the Quai Jean-Jacques Barthélémy and the Quai des Baux. Cassis—the Wine: Red, white, and rosé wines are produced in the Cassis AOC. The reds and rosés, typical for the area, are based on Grenache, Cinsault, and Mourvèdre with a smattering of other red grapes allowed in the mix. The white wines, of which the area is rightfully quite proud, are based on Marsanne (30–80%) and Clairette. Other allowed white grape varieties include Bourboulenc, Sauvignon Blanc, Pascal Blanc, Ugni Blanc, and Terret Blanc. The Cassis AOC is unique in rosé-heavy Provence in that white wines dominate its production; in fact, three out of every four bottles of Cassis AOC is a white wine. These wines are known for their aromas of citrus, white flowers, pears, and honey along with a touch of minerality. Generally fresh, dry, and medium-bodied, these wines are delightful when young, but may also improve in the bottle for 2 to 5 years. Not surprisingly, they pair perfectly with Mediterranean fish dishes as well as dishes made with tomatoes, olives, and herbs. Cassis—the Liqueur: Cassis (sometimes known as Crème de Cassis is a sweet, dark red liqueur flavored with black currants (sometimes known as cassis fruit). It is quite famous as an ingredient in the Kir cocktail—white wine (ideally Burgundy Aligoté) and crème de cassis—as well as its fancier cousin, the Kir Royale (ideally made with champagne). As with many things in life, you can get an inexpensive version of generic cassis at just about any corner liquor store and be done with it (try it on ice cream or in a Pompier cocktail [3 parts dry white vermouth, 1 part cassis, served tall over ice with soda]). On the other hand, there is the good stuff: France has several PGI versions of cassis, including those that hail from Bourgogne, Dijon, and Saintonge. Of these, the original—and most say the best—is the Cassis de Dijon. Sweet, fruit-flavored beverages were made in many places around Europe in the eighteenth century. These were often referred to ratafias and generally made with fortified wine or unfermented grape juice flavored with a variety of berries (and sometimes produced with a spirit base as well). True cassis began to be produced in Dijon in 1841 by a gentleman name Auguste-Denis Lagoute. Lagoute was a fan of the sweet ratafias but wanted to produce a beverage of a higher quality using local fruit. He began by soaking black currants, which grew in abundance around Dijon, in oak barrels along with high-proof spirits and beet sugar. 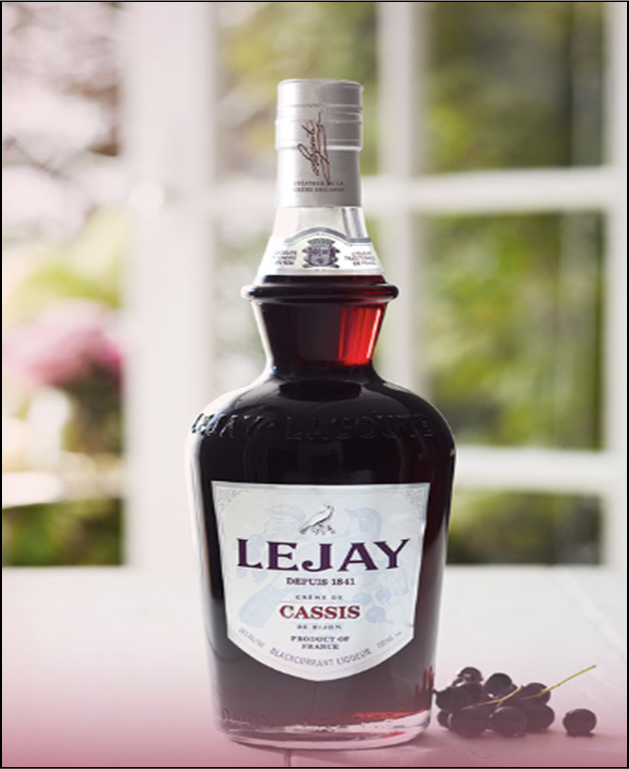 Soon the family’s brand of cassis, Lejay (named after the son-in-law), was wildly popular, particularly when served over ice with a splash of vermouth de Chambery, and later, when served as a Kir along with the white wine of the region. Lejay is still produced, and is one of the few producers approved to use the PGI of Cassis de Dijon. The PGI for Cassis de Dijon was first approved in 1923. 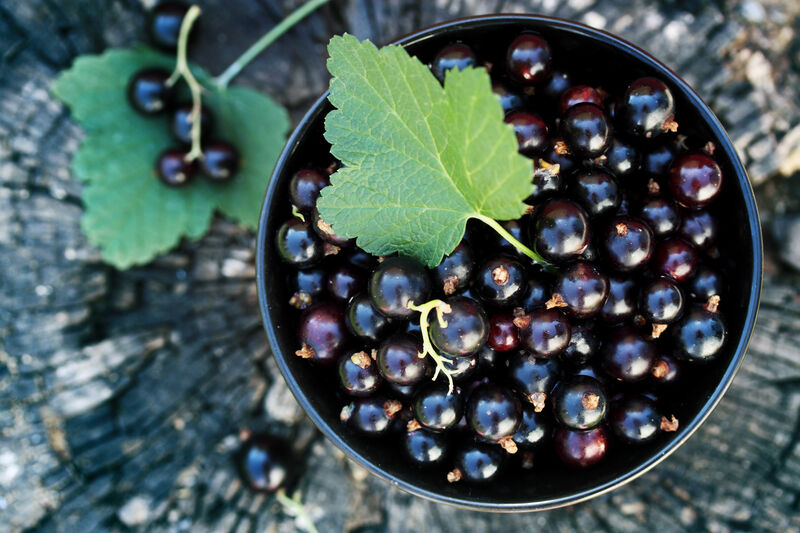 The regulations specify that the finished product contain at least 400 grams of beet sugar per liter (cane sugar is not permitted).The specific type of black currant is not defined, but in general there are two varieties of high-quality black currants: Noir de Bourgogne (known for its aromatics) and Black Down (considered to be a rounder, smoother, and sweeter variety). 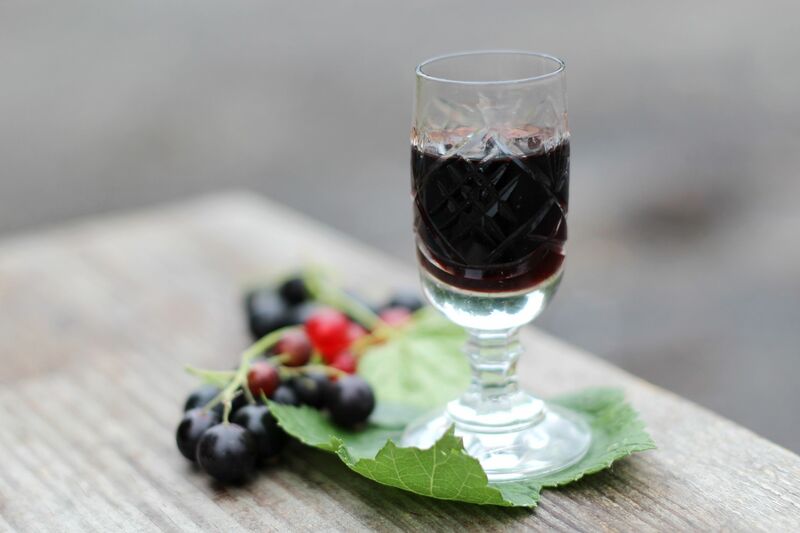 The finest Cassis is described as having aromas of black currants, cherries, and plums; a rich, velvety texture; intense, fruity flavor; and a sweet taste balanced with a bit of an acidic “snap.” Sounds good to me!